As the new year continues on, many Michigan residents are looking forward to filling their home with quality improvements. Upgrading your home lighting, for example, can result in major changes that can revolutionize your outdated space. Customers who are seeking indoor lighting in the Jenison area will be happy when they stop by our huge lighting showroom. The Lighting Corner has proudly served as your source for quality products and solutions since 1984. Our knowledgeable staff and expansive inventory ensure that you leave our Jenison lighting showroom happy! Today, we’ll continue to look at how pendant lighting fixtures can improve the aesthetics of your home. These hanging light fixtures are versatile and stylish, but only when sized and placed correctly. If you need help finding quality designer lighting options for your Michigan home, be sure to stop by today to begin! The island in your kitchen is often the perfect place for pendant lighting. Placing a fixture here can provide ideal task lighting while also acting as a stylish focal point for the space. It’s important to plan the dimensions of your hanging light fixture to avoid poor illumination or crowding. The height of your light should provide a good balance, generally resting between 28 and 36 inches above your countertop. If your ceilings are taller, it can help to place the lights roughly six feet off of the floor. The size of your island will play a large role in how many pendants you should use. Homeowners who focus on properly spacing their kitchen lighting fixtures will experience the best results. We recommend measuring your island and subtracting six inches from each side to calculate the amount of space you have for pendant lighting. It’s generally accepted to place your pendants at least two feet apart, but 30 inches is a better starting point. If your island is larger than the five-foot average, it can help to place a third pendant in the middle. Unlike other areas in the home, your dining room table can allow for more personal preferences over dimensional restrictions. One consideration to start with is how you plan on using your table pendant lighting. Your dining room table can be used for general illumination or task lighting for eating, studying, and so on. A general starting height is between 28 and 32 inches above your table, but be sure to make adjustments as needed if the placement doesn’t look right. Homeowners with larger dining room tables can hang two or even three pendants across the span, providing quality lighting coverage in addition to being visually stunning. Every home is different, so be sure to adjust the heights and locations as needed to create a quality visual. As always, our lighting experts can help! Pendant lighting can be a superior option for many homes, providing versatility in addition to its aesthetic value. 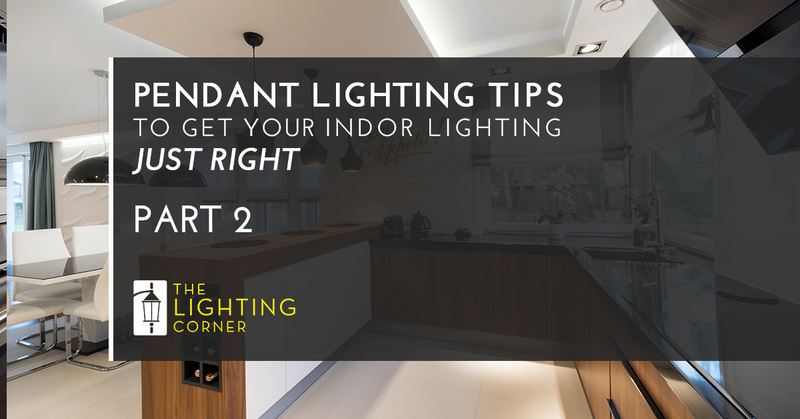 Next time, we’ll conclude this blog by discussing a few more key locations that can benefit from optimally installed hanging light fixtures. If you’re in need of quality outdoor or indoor lighting in the Jenison area, The Lighting Corner should be your next stop! Our fully stocked lighting showroom and staff of friendly experts ensure that you leave our store happy. Contact us today to learn more or stop by for showroom for help today!